Having a dream is something that we can definitely relate to. When some good friends let us in on the fact that they were pursuing theirs, we were thrilled that they let us go all out for them. Chef John had a vision that he’d been cultivating for years, and when the previous owner of one of downtown Decatur’s prime restaurant spots decided to retire, John heard opportunity knocking. 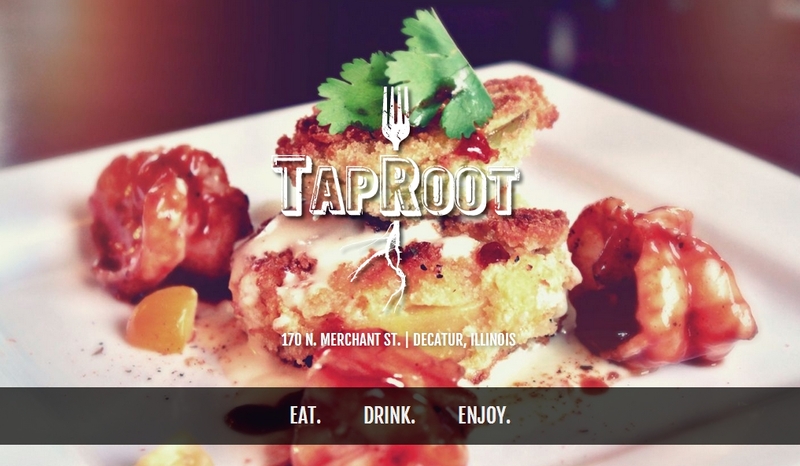 We started from just a description of John’s ideas of what he wanted the restaurant to be and the name TapRoot. We came up with several logo ideas for our first presentation. Needless to say, it was tough weeding them down. After a few revisions, we had our winner. This one was a textbook example of when we hit that “sweet spot” of potential when designing a logo. When we get the brand on track, the other marketing ideas just flow. We were asked to design everything from the graphics on the windows, to t-shirts, menus, coasters and even created a wood 3D version of the new logo for their guest welcome station. We also provided Decatur themed art for the banquet room, interior signage for the game room and elevator and we topped everything off with a modern responsive website filled with photos of their unique menu items. It’s exciting for the customer to see their vision taking shape and it is exciting for us to push things as far as we can take them. Give us the ball, and we’ll run with it!